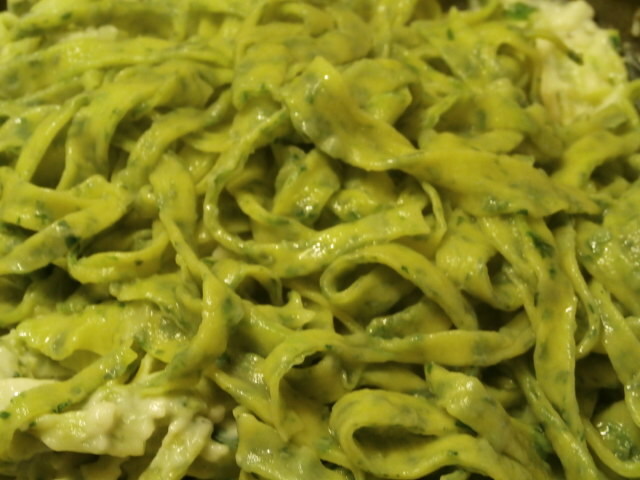 Last year on St. Patrick’s Day… LOL Make Your Own Green Fettucine! I’m a sneaky Mommy, and I don’t play by the rules. Always one to look for ways to sneak vegetables into dishes so that my son will unknowingly devour something tasty and yet get some vitamins in him at the same time. This last week I wrote the post on how to make your own pasta from scratch, with a promise to provide my journey through making Spinach or Kale pasta. I’m so proud of how it turned out – it was so temptingly good that the moment I snapped the last pictures and mixed it in with the Alfredo Sauce, I ate some!